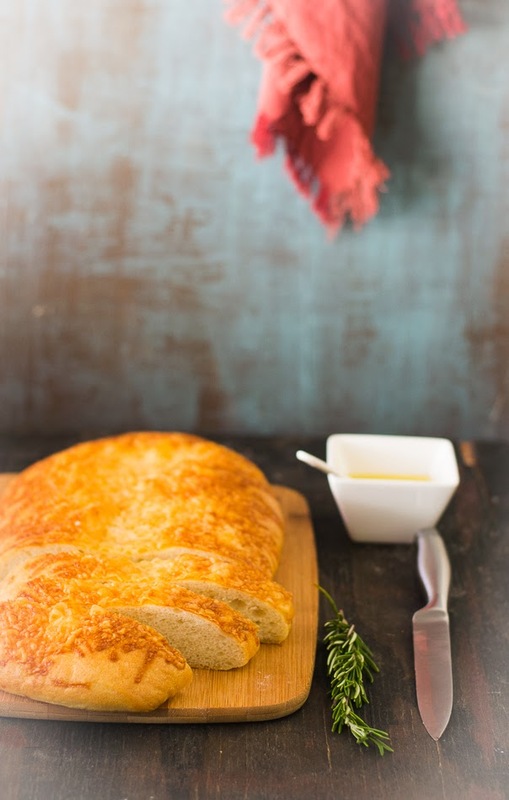 Off late I have been thinking about sharing a bread recipe instead of sharing same kind of dessert or curry recipes. Most of us get nervous when it comes to making any bread related stuff. I am not an expert either in this field. But when it’s something new, I get excited to try it out. So I went ahead and did the experiment with today’s recipe of Focaccia Bread. I tried couple of different recipes of Focaccia Bread and eventually decided to stick to below one. Hope you will like it. 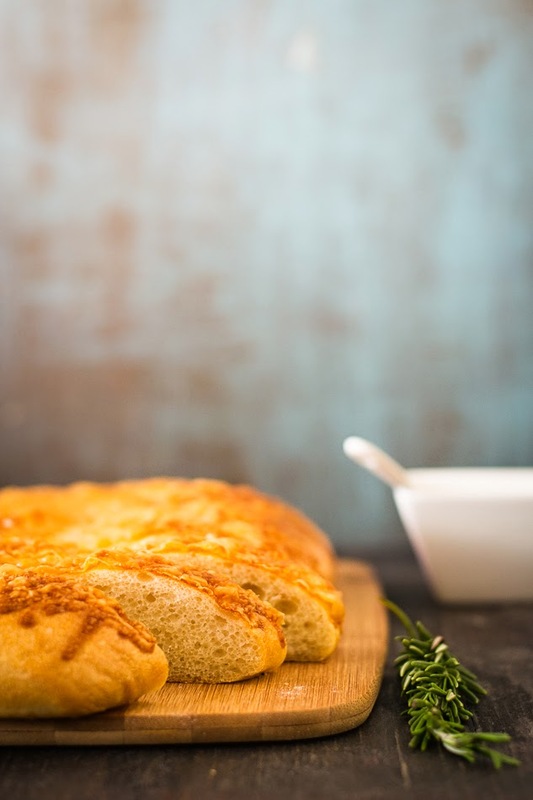 Before coming to the recipe, let me give a brief introduction of Focaccia Bread. It’s a flat oven-baked, very popular Italian bread. It can be used as a side to meals, as a base for pizza, or as sandwich bread. In style and texture, it’s quiet similar to pizza. If you want something simple and classic, try rosemary and sea salt toppings. But when I searched about Focaccia, I found dozens of different and delicious toppings. The ones I liked are caramelized onions, half olives, cheese and half jalapenos. 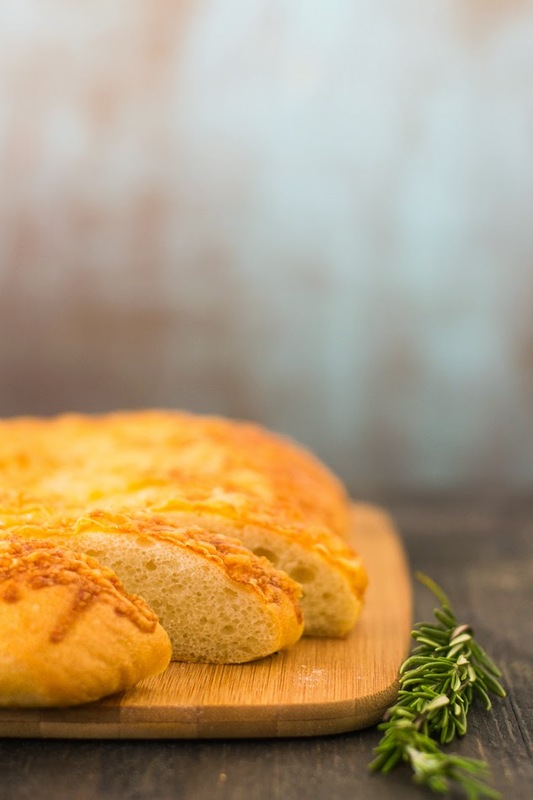 If you prefer to make focaccia to be a simple herby bread, you may allow only olive and herbs besides sea salt. It is best served when it is warm. The recipe that I have tried today is highly inspired by Lorraine Pascale's Focaccia Bread. Though I have changed a bit here and there. The process of making Focaccia starts by making a dough of flour, oil, water, salt, sugar and of course yeast. Then it’s baked in an oven. A common practice is dotting the unbaked bread to create multiple wells in the bread. It helps to preserve the moisture in the bread. As a next step, olive oil is spread over the dough prior to rising and baking. Here is the details of the recipe. 1. 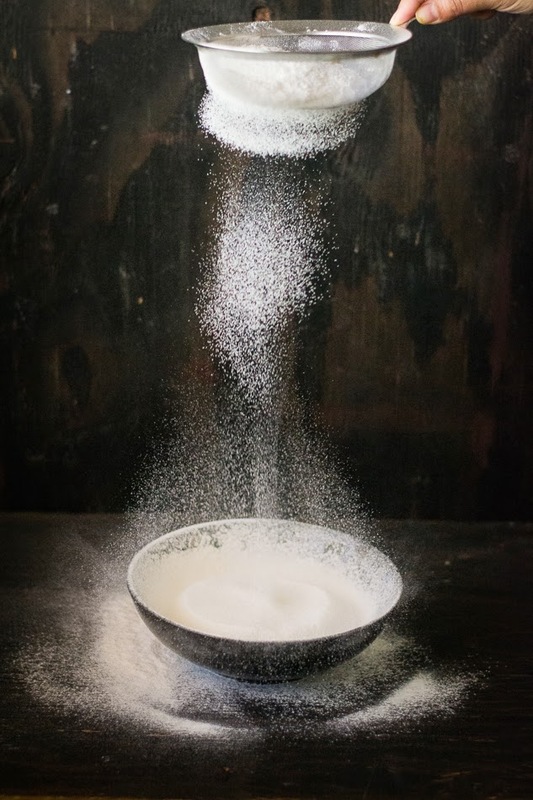 Take a mixing bowl, add yeast and warm water and whisk it. Add olive oil, salt, sugar and the flour. Mix it well using a wooden spoon until dough is too stiff and sticky to mix. 2. Turn the dough out onto a floured work surface. Knead the dough for about ten minutes by hand on lightly floured work surface. The dough will feel stretchy when it pulled. To test if the dough is ready, make a ball with dough then, using a well-floured finger poke a shallow indent in the side. If the dough springs back, then it is ready. Or knead it for a few minutes longer. Total kneading time is about 8 to 10 minutes. 3. Drizzle 1 tablespoon olive oil into a large bowl, place the dough into the bowl. Coat it with extra olive oil. Cover the bowl with aluminum foil and let it rise in a warm place until the volume gets doubled. It will take 1 to 2 hrs. 4. Take a baking sheet, coat with olive oil / oil. Turn the dough out into the prepared pan. Press gently into a rough oval or rectangular shape. Cover the pan loosely with plastic wrap. Let it rest for 15 minutes. 5. Drizzle 1-2 tablespoons more olive oil on the top of the dough. Poke oil-covered fingers deeply into the dough to make dimples all over the surface. Let it rise again until the dough becomes double, it will take approximately 45 minutes. 6. 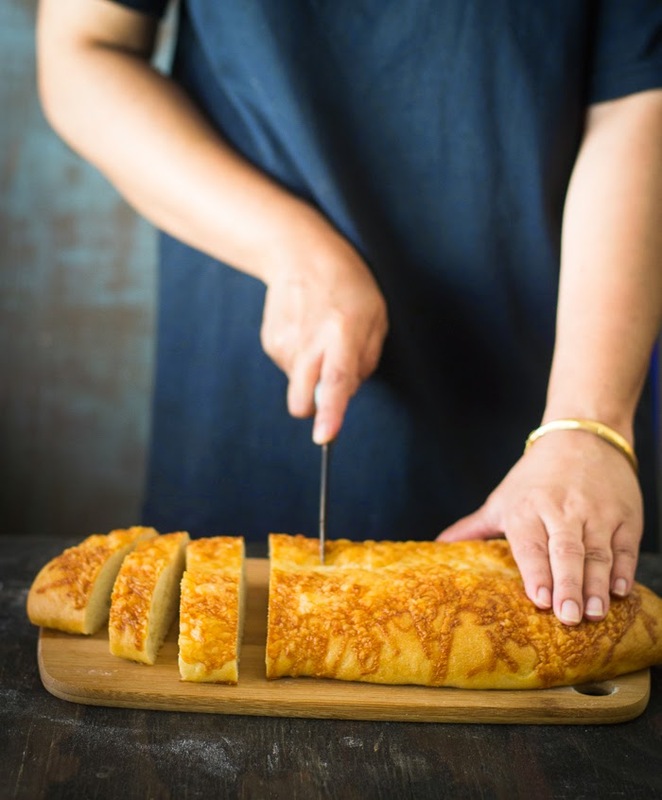 Preheat oven to 400 degrees F or 200 degrees C. Drizzle 1 more tablespoons oil on the surface of the dough, sprinkle cheese, rosemary ( optional ), or other toppings ( as per your choice), Sprinkle some sea salt over the dough. Bake in the preheated oven for about 25 to 30 minutes, or until the bread is well risen and light golden brown. 7. Remove from the oven, drizzle with 1 tablespoon of olive oil and brush it on the top of the loaf, leave to cool on the baking pan. Cut and serve. Indo-Chinese Cuisine is my weakness; probably the same is true for most of the non-vegetarian Indians. When we grew up in nineties, India was yet to be globalized and the American or Italian cuisines like Burger, Fries, Pizza or Pasta didn’t make their entry to my home country. At that time, Chinese cuisine was the only option for dinning out. Calcutta has a long history of pioneering Indian style of Chinese food, mainly because of its reasonable Chinese population from pre-independence era. India’s only Chinatown is located in Calcutta and it’s the place that started the Calcutta’s famous roadside stalls of Chinese food. These food stalls adopted Chinese cuisine with mixing Indian taste into it. 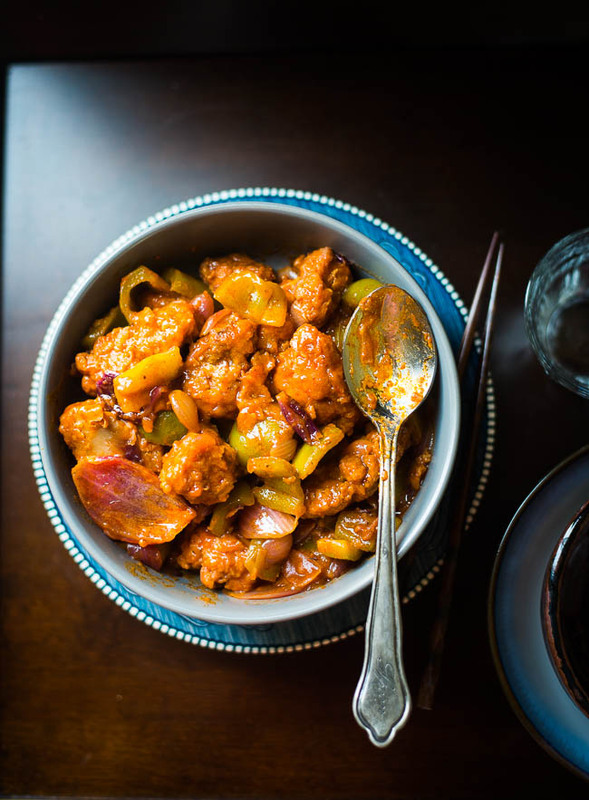 Today the Chinese food has become an integral part of the Indian culinary. 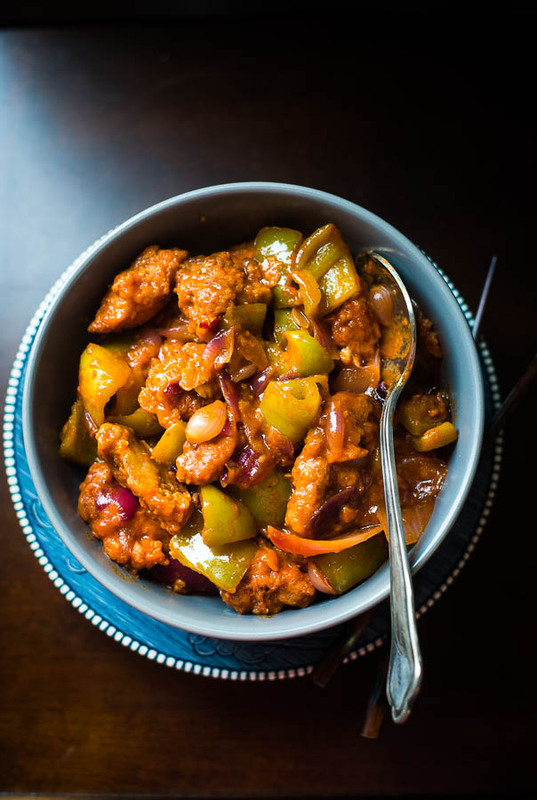 Chilli Chicken is one of the popular dishes in this cuisine and I am going to share its recipe today. In abroad, we miss those road side stalls, the big wok, the smell of burnt garlic, soy sauce, the sound of stir-frying. So once in a while I try to make this dish at home because it’s both my son and husband’s favorite one. 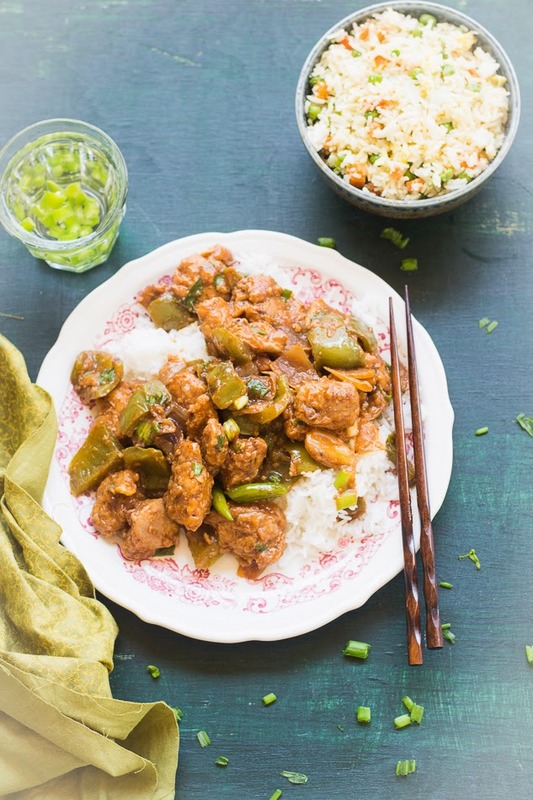 In general, Chilli Chicken refers to a type of dry chicken preparations that is made with fresh chili peppers. There is no standard recipe for it and everyone makes their own version of this popular dish. 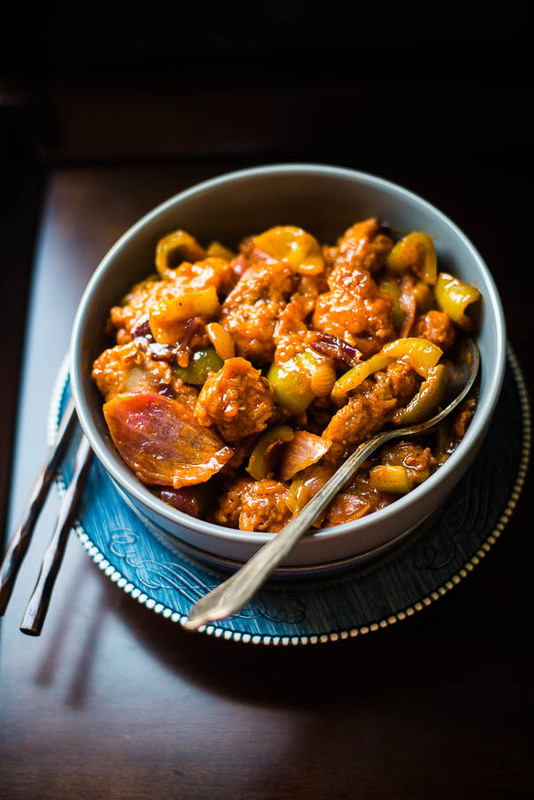 There are multiple variations of chilli chicken recipes. 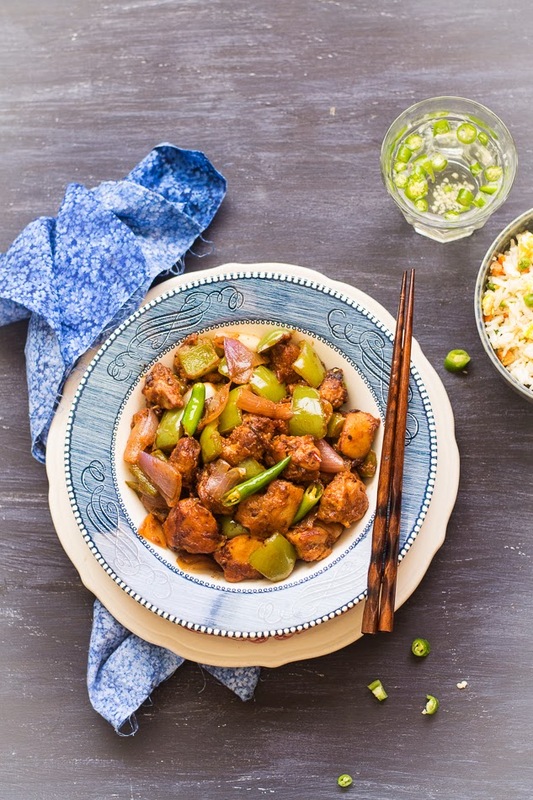 More commonly boneless chickens are used in Chilli Chicken and batter-fried chicken cubes are stir-fried with onions and green bell-peppers. They are coated with hot and spicy sauce. Sometimes it comes up with little gravy, but generally people prefer to cook it dry or without gravy. It goes well with fried rice or chowmein. 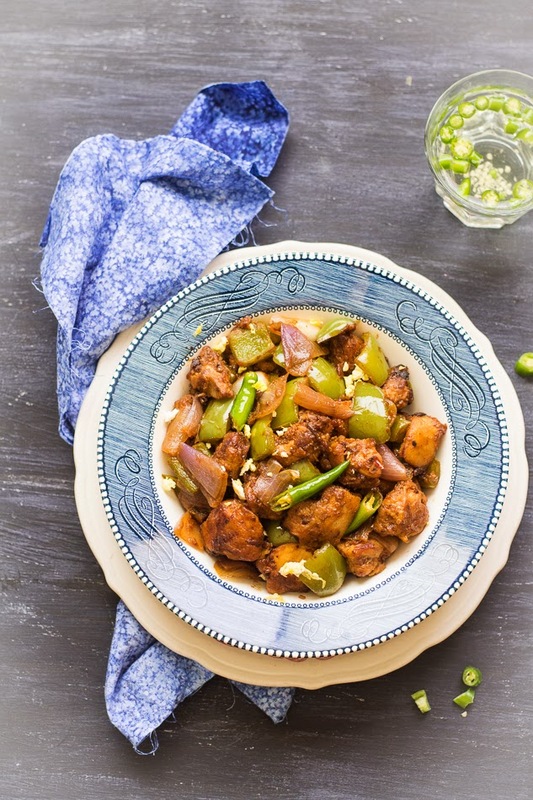 If you don’t like chicken, the same recipe can be tried with fish / vegetables / Paneer. I have learnt this dish couple of years ago and always make the healthier version which means that there is no MSG and with less sodium soy sauce and no food color. You should find the recipe is easy and quick to prepare. Onion : 1 big one, or 2 medium, cut into 1 inch chunk. Green Bell peppers / capsicum : 2 small, or 1 big, chop into 1 inch sized square pieces. 1. Wash and pat dry the chicken pieces. Take a big bowl and place the chicken pieces into it. Add vinegar, ginger paste, garlic paste, soy sauce, chili sauce, pepper powder to it. Mix it well and let it rest for 15 to 20 minutes. 2. Remove the excess water from the chicken. ( if required ) Now add the beaten egg and cornstarch to the marinated chicken pieces. Mix it well again until the chicken pieces get a coat of cornstarch. 4. Take a wok or a big pan, add 2-3 tablespoons oil. 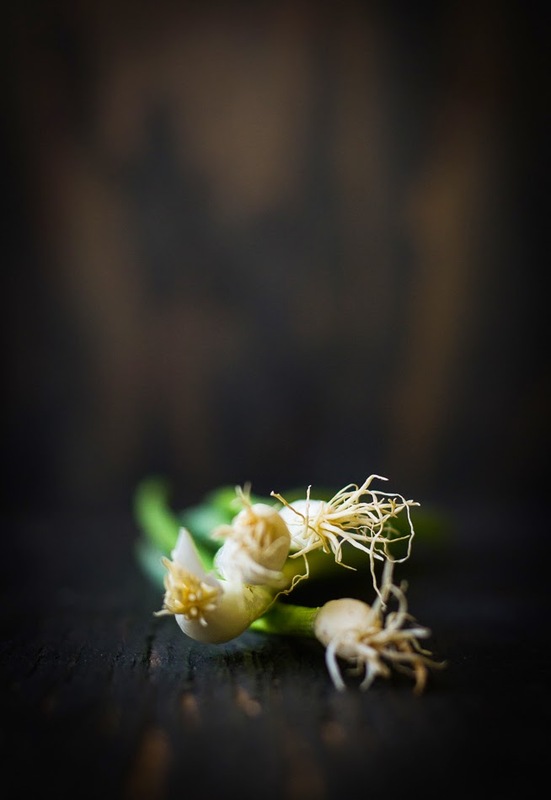 Once oil is hot, add the ginger garlic paste. Give some stirs and add chopped onions, green bell peppers and green chillies. Saute them for few minutes over high flame. Do not overcook, the onions and bell peppers should remain crunchy. 5. Add soy sauce, chili sauce and tomato ketchup. Stir to mix it nicely. Add chicken pieces, stir and mix until chicken pieces are well coated with sauce. Check the seasoning and add salt or sauces if needed. Add the chopped spring onions and stir. If you want the dry version of Chilli Chicken. Switch off the gas and serve it with Fried Rice or Chowmein or can serve it as an appetizer. 6. If you like to have your Chilli Chicken with thick gravy, then mix the cornstarch with water and add the mixture to the prepared chilli chicken. Stir and mix it for couple of minutes over medium high heat. Serve hot. After a break, I am back with a traditional Indian sweet dish today. When I noticed that my last post was 100thone, made a plan to celebrate this event with some dessert recipe. Thanks to all of my readers to follow this blog and encourage me all the time. 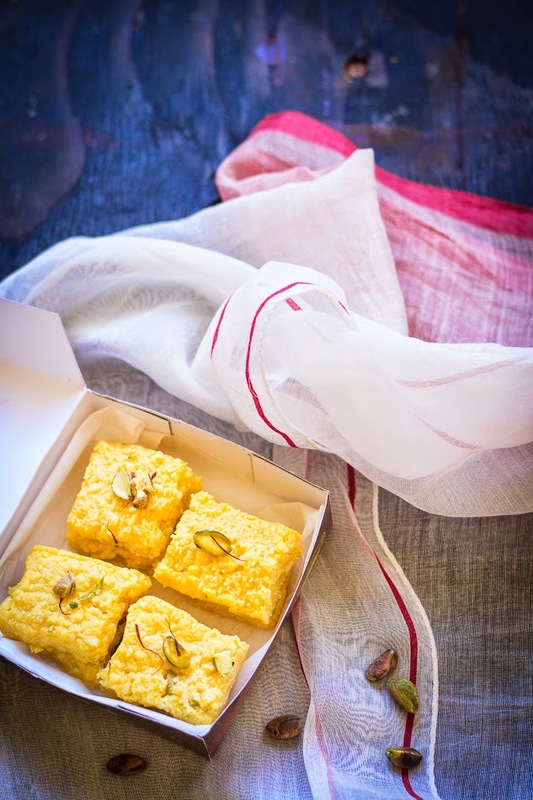 When it comes to sweets, you will find different variety of cuisines in India. Some of these dishes are popular only in a specific region. But there are others that get widely popular and manage to cross boundaries of many states and regions. 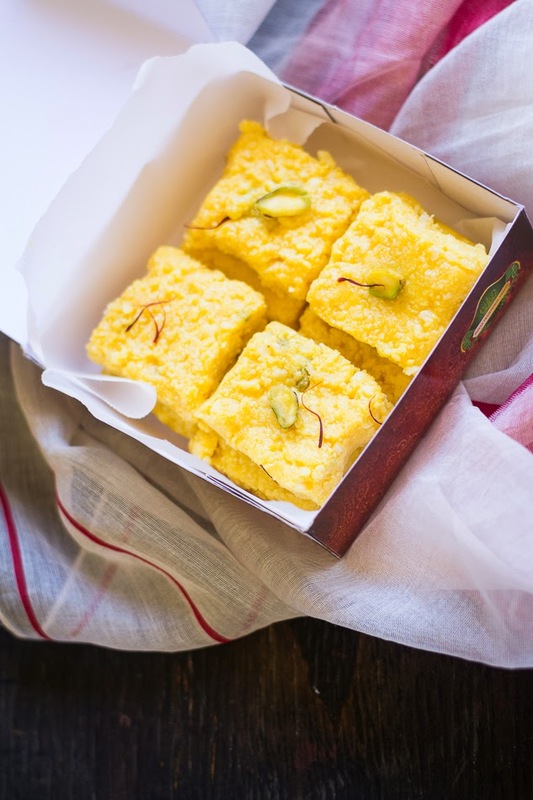 Kalakand is one such sweet preparation, which was invented in northern part of India, specifically in Rajasthan. But it has made its name in every part of the country and commonly appears during festival season of either parts of India. 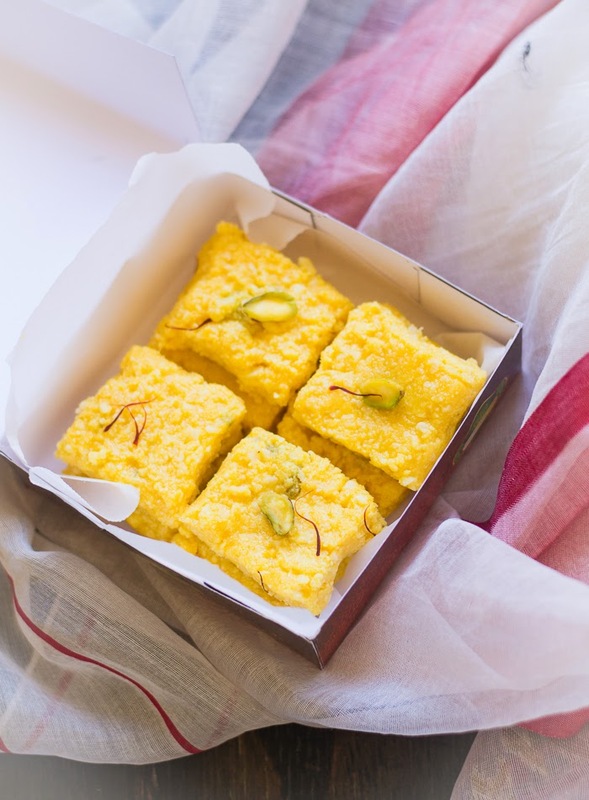 Kalakand, also known as Sandesh, is made out of solidified, sweetened milk and cottage cheese.The name of this Soft, crumbly, bite size , milky-white, square-shaped sweet makes all Indian’s mouth water. 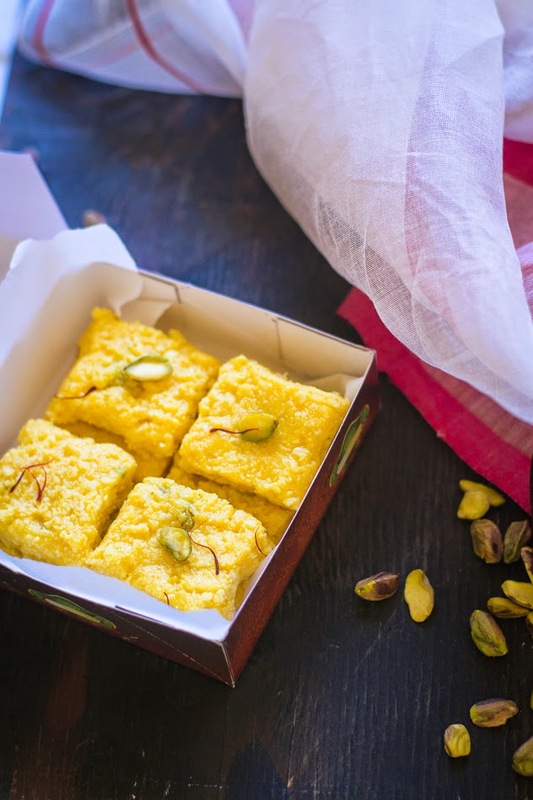 You can follow several different styles to make kalakand. In one process, it’s preferred to use sweetened and solidified milk(khoya), while others like to use condensed milk. The whole preparation can be either done in a microwave or on a stove-top, whatever is the easier way for you. I am not against the fact that the traditional method can still provide you the best results. It gives the best texture and the perfect softness, but at the same time, the easier method is not that bad as well! Though I have tried both, today I will share the traditional one. The process starts with making some fresh paneer. All you need is whole milk and something acidic, like lemon juice or vinegar. Making Paneer at home is little time-consuming. If you would like to take the short route, you can however skip this step completely. I mean, you can buy paneer from any Indian store or replace paneer with ricotta cheese. But I have preferred to use fresh paneer. As I said, most of the time Kalakand looks milky white. But since I added some mango pulp to give some summer flavor, so it got a nice yellow color in my preparation. Hope you would like this than the usual kalakand. 1. Mash paneer coarsely and add milk powder to it. Add the condensed milk and mix it nicely. 2. Take a thick bottomed pan, pour the mixture into it and heat it up. Cook on medium high heat. Add the cardamoms and mango pulp. Stir continuously till the mixture becomes thick. It will take 8 to 10 minutes (approximately ). 3. Remove from heat, and spread it on to a greased dish. 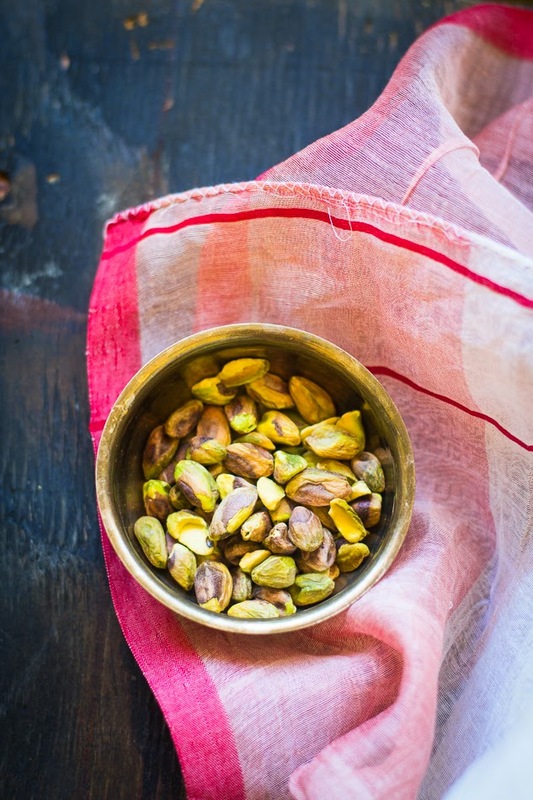 Sprinkle chopped pistachios. 4. Put it into the refrigerator and let it cool. Cut into squares and serve.